The Knights of Columbus, a Catholic organization that has been heavily involved in raising awareness and bringing aid to persecuted Christians in the Middle East, announced Tuesday that they plan to raise and donate $2 million to save the town of Karamdes, a predominantly-Christian town on the Nineveh Plans liberated from ISIS late last year. The Knights plan to help move hundreds of Christian families and others from minority religious communities in Iraq back to the homes from which they were forced to flee due to ISIS in 2014. The Archdiocese of Erbil, which currently has the largest population of Christian refugees in Iraq, will partner with the Knights in a resettlement and rebuilding effort. The Knights are asking their councils, parishes, and others who want to help to donate $2,000 – which is the approximate cost of one family’s resettlement. Knights CEO Carl Anderson also announced Tuesday that the group will partner with the U.S Conference of Catholic Bishops on a “Week of Awareness” for persecuted Christians beginning Nov. 26. 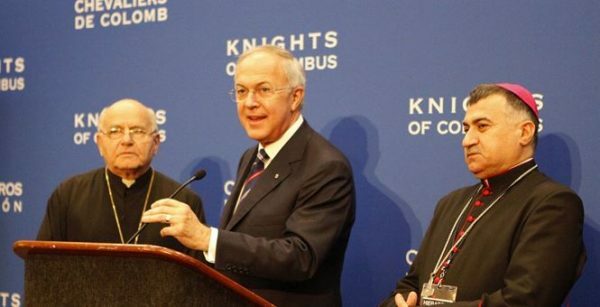 The Knights of Columbus Christian Refugee Relief Fund has donated more than $13 million for humanitarian aid to Iraq, Syria and the surrounding region. The Knights’ genocide report, which detailed ISIS’ atrocities against Middle East Christians, helped lead to Secretary of State John Kerry’s 2016 genocide declarationfor Christians and other religious minorities in the region. The designation was reaffirmed by Secretary of State Rex Tillerson last week.